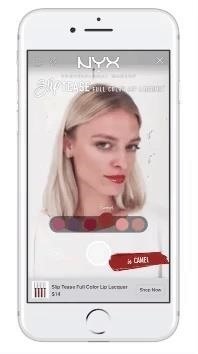 Already one of the leaders in augmented reality for cosmetics, L'Oréal is extending the reach of its ModiFace virtual try-on platform through a partnership with Facebook. 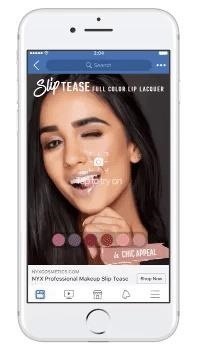 The cosmetics company will be integrating the augmented reality experiences built with Modiface into Facebook's AR camera, enabling customers to try on virtual shades of makeup. 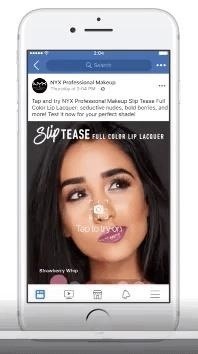 The first such experience, launching later this month, will feature NYX Professional Makeup, with other brands, such as Maybelline, L'Oréal Paris, Lancôme, Giorgio Armani, Yves Saint Laurent, Urban Decay, and Shu Uemura, to follow. "Facebook and L'Oréal share the vision that augmented reality is becoming key for product and brand discovery and purchase," said Lubomira Rochet, L'Oréal chief digital officer, in a statement. "We are at that magical moment when technologies have matured enough and consumer appetite for using them is growing everywhere. We are very excited about that new step in our long-term partnership with Facebook. One fascinating aspect of this partnership is that it keeps us innovating the beauty user experience. After having adapted our creatives and contents to a mobile-first world it will be very interesting to see how AR is going to change the creative playbook of our industry." Facebook has made numerous efforts to monetize its AR platform through marketing partnerships, including bringing AR ads to its News Feed, extending branded AR experiences to Facebook Messenger, and adding advertising-friendly capabilities such as image recognition. "People want new ways to experience products and services and Facebook's Augmented Reality platform can make that happen today," said Will Platt-Higgins, VP of global account partnerships at Facebook. "By bringing AR into the mainstream L'Oréal and Modiface are reshaping the beauty experience and we're thrilled to see this brought to life on Facebook." For Modiface, this is the first new development we've heard from them since L'Oréal acquired the computer vision AR company earlier this year, but given the pace of innovation for marketing-led AR strategies, and the return on investment, it's not likely to be the last. "This deep collaboration is very relevant for ModiFace since it will allow our AR experiences to live on Facebook and be used by millions of consumers across the world," said Parham Aarabi, CEO and founder of ModiFace. "This is a great new way to discover L'Oréal products and brands through very realistic, engaging, and meaningful beauty experiences." The partnership goes together better than champagne eyeshadow and coral lipstick (or so I'm told). But there's a missed opportunity here — why not call it ModiFacebook? !